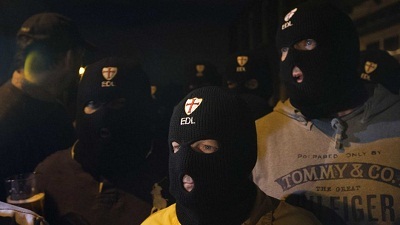 Scores of balaclava-clad English Defence League (“EDL”) supporters converged in Harold town centre overnight to protest against Muslims wearing veils. “Them Muslims should be banned from wearing veils – they shouldn’t be allowed to hide their faces” said Gavin, an EDL supporter who wouldn’t give his last name. “Muslims go home – England for the Polish” shouted Jerzey “Smith”, a carpenter from Essex. Other EDL members just tried to stare threateningly but soon gave up when local children mistook them for clowns. Local publican Eddie said while he didn’t agree with the sentiment behind the protest, the EDL members were still welcome to enjoy a post-protest drink at the Squirrellicker’s Arms.